On Thursday and Friday of last week, the junior class took part in junior interviews. Dressed in their business attire and prepared with resumes, students sat down with volunteer interviewers to answer their questions. The interviews, a Howard County graduation requirement, are meant to help students exercise real-world skills; they allow juniors to practice and prepare for future job and college situations as they near the end of their high school careers. To put it simply: last Tuesday, I, as well as my teachers and classmates, endured an unimaginably dangerous commute to school. What normally takes me at most, 15 minutes, to get to school, took me about 45. Overnight, freezing rain and sleet covered the roads, trees and powerlines. I woke up to a two-hour delay, waiting for the tweet from Howard County that schools would be cancelled. I mean– closing schools was the logical thing considering the amount of ice and the condition of the roads. 7:30 came around and I was still refreshing the page. Once I had come to terms with the fact that I did have to get up, I started to get ready for the day. Heeding my mother’s advice, I opted to take the bus rather than drive. All was going well on the bus ride– at first. On the radio, I heard bus drivers chatter about not being able to get up hills, trees sagging from the weight of last night’s ice, and roads that seemed virtually impassable. I didn’t think much of it and put my headphones back in. It all started to go downhill- or, in this case, uphill- when the bus turned on to a street with a hill that’s hard to get up on a normal day. I was convinced we were going to slide because no matter how hard he tried, the driver couldn’t make it up the hill. Eventually, we did, but not without a struggle. I let out a sigh of relief and hoped that was the end of the mayhem. As I should’ve learned when I thought school would be cancelled, I was wrong. We had made it to Centennial Lane, right before the elementary school. Traffic was at a standstill. After about five minutes of stop-and-go traffic, blue and red lights came into vision. Police surrounded the scene of a downed tree that had fallen onto someone’s car. That’s when everything clicked for me: why on earth was I on my way to school? According to an article from the Washington Post, at the peak of the icy conditions, there were around 15,000 power outages across the entire state of Maryland. Aside from the power outages, CBS Baltimore reported that the Maryland State Police acted on 226 accidents from Sunday, February 10, at midnight to Tuesday, February 12, at 5am. I couldn’t believe the statistics. It’s baffling to me that so many people were put at risk, and at what cost? Just to save us from an extra day or two at the end of the year? 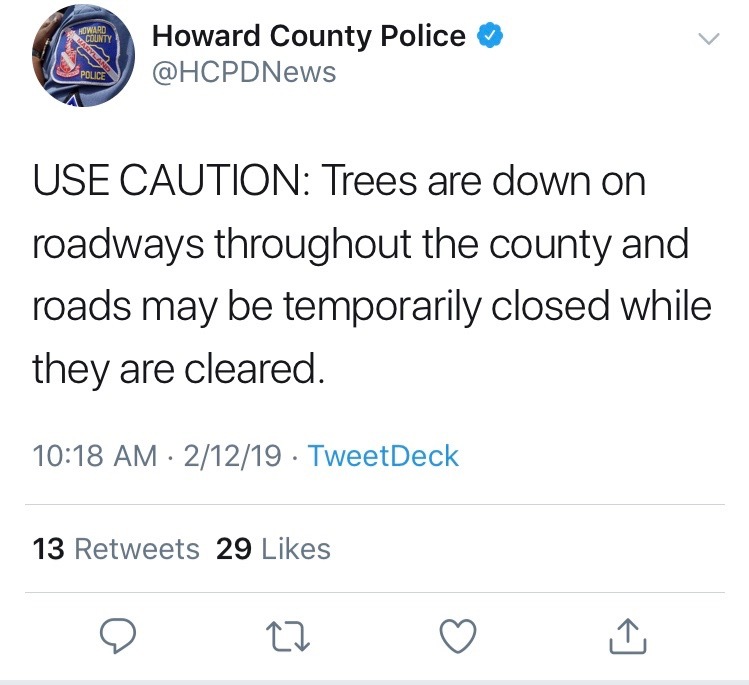 What made all of this worse was the tweet from the Howard County Police Department advising people to be careful of the trees blocking the road and the ice covering the streets. Ironically, the tweet fell right around the same time that an announcement at school was made about ARL buses being sent out. So after all of these awful conditions were reported, they were going to send out more kids and buses? And afterwards go pick up middle school and elementary school kids? Last week’s weather conditions combined with HCPSS’ poor judgement put thousands of children and staff at risk. The right call would’ve been to have the two-hour delay, take note of the terribly hazardous state of the roads, and then close schools. These dangerous conditions may make a return. A winter storm warning has been issued by the National Weather Service from 1am to 7pm for tomorrow, Wednesday, February 20. Snow, ice, and sleet are all that can be expected from the storm, and predictions call for 4-6 inches of accumulation. There’s no doubt that judging when schools should close is a tough call. There are lots of variables to take into account like snow on tree branches, ice on the roads, and power outages. My hope is that HCPSS learns from their previous decision last Tuesday to ensure the safety of the Howard County community tomorrow and always. On Friday, October 25, 2018, Centennial’s advanced composition class hosted National Writing Day. The different activities that took place ranged from contests to cafeteria games. Students were able to participate in contests like the haiku contest, guess the teacher haiku contest, and caption the meme. Upon entering the building, students were greeted by quotes about writing written on the sidewalk by the advanced composition students who stayed after school on Thursday. During lunch, advanced composition students walked around the cafeteria engaging students in writing activities, in their black shirts decorated with their responses to the question, “Why write?” The contests were just one part of the day, as many advanced composition students taught classes with prepared activities involving writing. Both students and staff came together to celebrate writing. This story has been revised and updated September 14, 2018, 7:04 a.m. to correct the strength of the storm as it makes landfall on the Carolina coast. 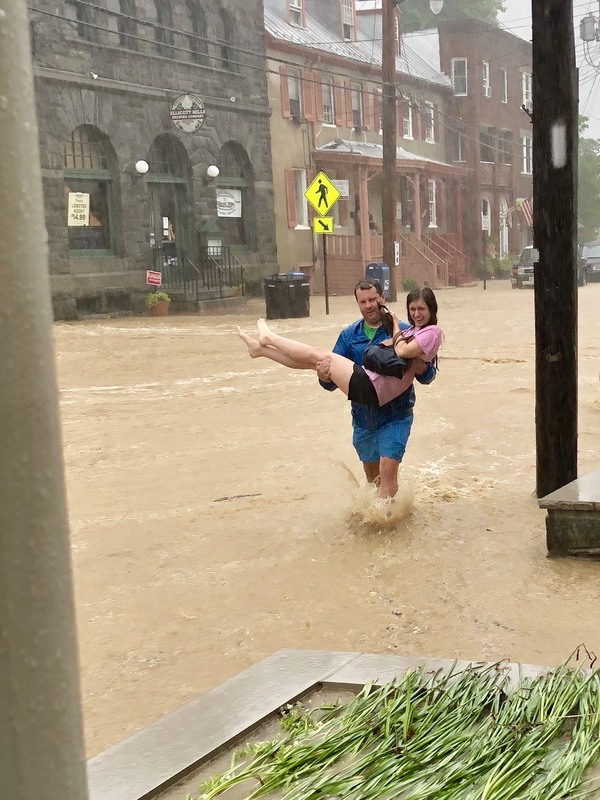 After a long summer of record-breaking heat, the east coast prepares to take on Hurricane Florence, a Category 4 storm originating from the lower Atlantic Ocean, just south of Bermuda. Residents of southern states like Tennessee, Georgia, North Carolina and South Carolina are strongly advised to evacuate and brace themselves and their homes. The northern east coast can anticipate heavy rainfall around Tuesday as the storm takes a sharp turn. With the storm expected to make landfall first in North Carolina on Friday, September 14, meteorologists predict the storm will then transition into a Category 1 storm. As Florence approaches quicker everyday, states in the storm’s direct path like North Carolina and South Carolina, prepare for the worst, but hope for the best. For weeks, juniors have been preparing for a rite of passage: junior interviews. Every year the junior class drafts resumes and dresses up for the mock interviews, a requirement to graduate, in order to prepare for real life interview situations. Originally, the interviews were supposed to be during the last week of March, however due to snow days, they took place this week on April 9 and 10. The interviewers, typically various community members, sit down with each student and ask them interview-style questions. These questions range from goals and aspirations to favorite books or movies. During the interview, the interviewer records notes on a feedback paper which is later handed back to the student. The paper covers criteria such as eye contact, sociability, and the quality of the resume. Many students go into the interviews nervous, so the sense of relief once finished is like no other. To all future juniors: a firm handshake and a smile goes a long way!